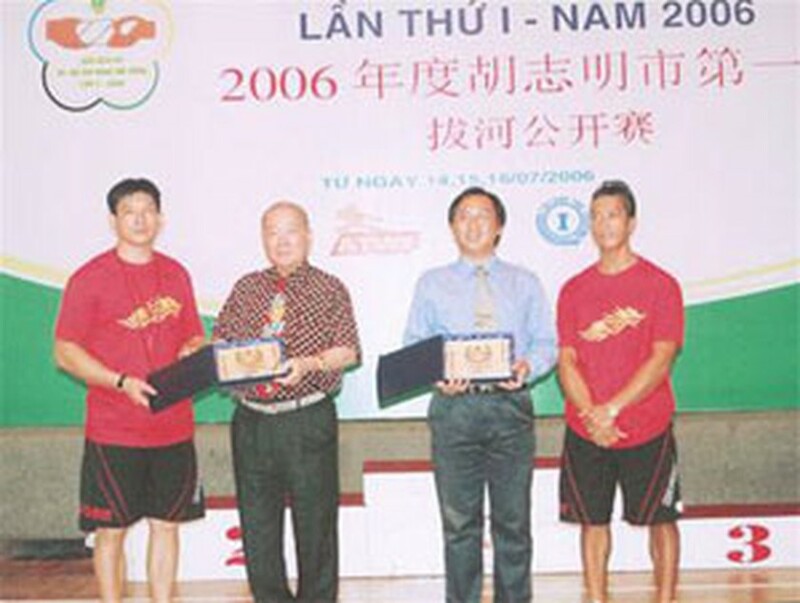 Wu Wen Ta (second from left) holds a souvenir of his Ho Chi Minh City visit presented by members of the city’s tug-of-war team. Few Vietnamese people would describe tug-of-war as a serious sport or would be aware that Ho Chi Minh City has just sent a team to Japan for the sixth Asian Tug-of-war Championships, where they will represent Viet Nam. It’s the country’s first foray into the world of international rope-pulling and has happened in no small part thanks to the support of Wu Wen Ta, chairman of the Tug-of-War Asian Federation. 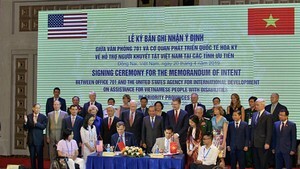 He and several federation experts visited Ho Chi Minh City last year on a mission to convince the Vietnamese people that tug-of-war should be taken seriously. In partnership with the Department of Sport, the federation ran workshops on the rules of tug-of-war and on refereeing the sport. Since then, the department has announced that a Ho Chi Minh City Tug-of-War Association will be established sometime soon. Most members of the team that left for Japan yesterday are weight-lifters, wrestlers and such (the sort of big, strong men you need). “Thanks to the training by the foreign expert, Ho Chi Minh City’s tug-of-war team is on the move,” says Mai Ba Hung, director of the District 1 Sport Center. Representing Viet Nam as an unofficial member of the Asian federation, the team will be competing against 15 fully fledged members in the Asian Tug-of-War Championship. However, Mr. Hung says Viet Nam will be made an official member after the tournament in Japan. There is also a Tug-of-War International Federation. It has 35 members and is based in the USA (www.tugofwar-twif.org). In international competition, a tug-of-war team can have up to eight members, and they must be at least 16 years old. The person on the end of the rope must wear protective headgear. Eight is also the number of weight categories: Ultra Featherweight (not exceeding 480 kilograms), Featherweight (up to 520 kilograms), Lightweight (up to 560 kilograms), Light Middleweight (up to 600 kilograms), Middleweight (up to 640 kilograms), Cruiserweight (up to 680 kilograms), Heavyweight (up to 720 kilograms) and Catchweight (above 720 kilograms). There are separate indoor and outdoor events.